I love to sing, and for some time I've been searching for a choir that feels like a good fit for me. I believe I've finally found it. I started singing with the South Seattle Community College's Community Choir in the fall of 2012. 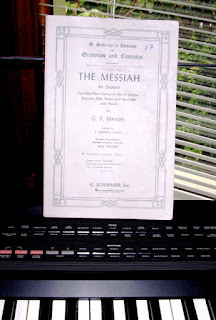 We performed our "Mostly Messiah" holiday concert in early December. We sang 5 pieces from Handel's "Messiah," along with a French carol, a Hanukah song, an a cappella gospel song and a lush, contemplative ballad. I am neither a trained nor an accomplished singer. (Lucky for me, the Community Choir is a non-audition choir.) The Messiah pieces were the most difficult I've ever sung. It took a lot of practice and I had to google "breathing exercises for singers" to learn how to support those high notes and runs. But it was so worth it! The experience of singing that magnificent music was an absolute joy. Below are links to a few highlights from the concert. I hope you enjoy listening to them. The man doing the sound for us was sitting with young children, so you will hear them "accompanying" us. Their little voices make for a more of a "live" experience and well, like I said, we are an inclusive, non-audition choir. Many, many thanks to Paula Herd, our ever-patient Choir Director, and Edie Martin, our brilliant Pianist, for making this experience possible.